One of the ways to better understand your sermon is to think through the different emotions you intend your hearers to experience in response to the truths of God’s Word. Every sermon has an emotional flow but likely few pastors think strategically about how the different elements of the message they’ve put together guides the feelings of the listener. Make no mistake, this isn’t about manipulating others or putting together a message on the foundation of emotion. Sermons should clearly explain the text in a way faithful to the text. However, preaching God’s Word will have an impact on the emotions of those who hear it. Period. I’m simply suggesting pastors take a moment to think through their message ’emotionally’ to see if the progression for the hearer in the sermon is coherent, helpful and thoughtful. Or does it have force the listener into emotional whiplashes, flat spots or dead ends. 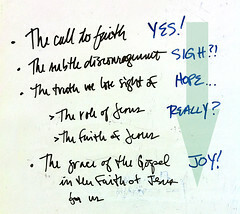 I’m hoping that the person listening to my exposition of Hebrews 11:32-12:2 will move from excitement to discouragement to blossoming hope to an “Aha” moment to joy found only in the gospel. Again, will it work just like that? I don’t know. The Holy Spirit will have the final say. However, just thinking about the emotional flow of my message allowed moved me from being stuck in sermon prep process to actually getting down the road sermon-wise. Sermons aren’t all about emotion but they can’t be anything less than emotional. Ask yourself, “What’s the emotional flow of this weekend’s message?” Remember, we preach to the entire person – head, hands…and heart. Seeing your sermon emotionally may be one more way for some to do that better. Wow! I should not be surprised that this was intentional on your part. When I was listening to your sermon I was thinking how strategic it was for you to take us through the emotions like that, but I didn’t realize you actually thought about that specifically!! I just saw this post today! Very cool.